When it comes to Christmas decorating, it’s almost impossible to have too many ideas. In fact, many people change up their Christmas décor on an annual basis. It’s something fun, exciting and gives you plenty of cheer in the cold months of the year. If you’re looking for new ways to liven up your front door for Christmas, here are 20 cute Christmas decoration ideas to try. Gift-Box Topiary—Grab a footed urn and pile large, wrapped boxes on top. Make sure the boxes are wrapped with big bows and pile them slightly askew for the best effect. Christmas Door Frames—If you’ve got an old frame that needs new life, this is a great project to try. Paint the frame a new, festive color, and top it with a bow and a coordinating cluster of ornaments. Hang it on your door similarly to a wreath. Knitter’s Wreath—Make your door festive and individualistic at the same time with a wreath. One can be made out of yarn balls and stop with knitting needles. Your Initials—Create or buy a custom monogram using your family initials. This can be created from wood or another type of material. Top with a bow and your door will look amazing. Unique Garland—If you’re tired of the typical pine garland, try making one from branches of a tree in your area. Line with lights for an impressive look. Bright Columns—If you have columns by your door, try wrapping them tightly with lots of lights. Wrap railings and other architectural details for a radiant shimmer. Surprising Shutters—Try to repurpose architectural elements, such as a large pair of shutters. When given a new coat of paint, they can provide a fresh, festive look. Modern Greenery—Freshen up a boring door with new wreath made from modern elements such as pheasant feathers and green apples. This simple but edgy combination brightens up your door. Illuminated Walkway—Try putting simple glass votives lined with sprigs of berries and greenery on your walkway. The candles will help make your entrance more welcoming. Layered Decorations—Have a plethora of decorations? Try layering them by your door, blending unexpected touches with traditional themes. For example, you could mix bows, greenery and old-fashioned ice skates. Courtyard Christmas Tree—If you have a covered courtyard, try adding a lighted, decorated Christmas tree. This festive addition will make your entryway festive and more welcoming. Add Pinecones—Go the rustic route with your garland and add pinecones. They provide a classic, rustic look. Snowman Wreath—Take three wreaths: one large size, one medium size and one small size. Hang them on your door, starting with the large at the bottom, then medium, then small. Top with a hat and scarf. Boxwood Wreath—Take the trimmings from your boxwood bushes and make them into a wreath for your front door. A large, red bow will make it more festive. Candy Canes—Take two, large pre-lit candy canes and place them on both sides of your front door. The canes act as the perfect frame for a door. Hanging Ornaments—This is a perfect idea if you’ve got a covered porch. Hang large ornaments of varying sizes from ribbon just above your door. Star Planter—Take three star-shaped wreaths of varying sizes and stack them on top of each other. Use a planting pot as a base. Add greenery to the pot to make it more festive. Candy Wonderland—Frame your doorway using Christmas ornaments that look like peppermint For the best effect, use varying sizes of bulbs. Red and silver bulbs look gorgeous in this arrangement, too. Christmas Basket—Instead of a wreath, try hanging a basket filled with various greens. Evergreens, red leaf branches and red berries look festive. 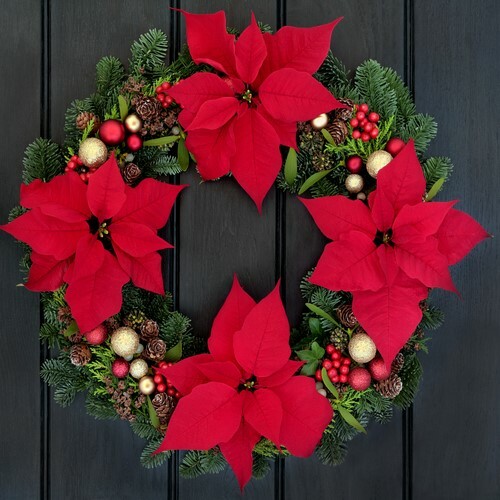 Poinsettia Wreath—Use fresh or fake poinsettia flowers to make a large, round wreath for your door. A bow is optional for this wreath. 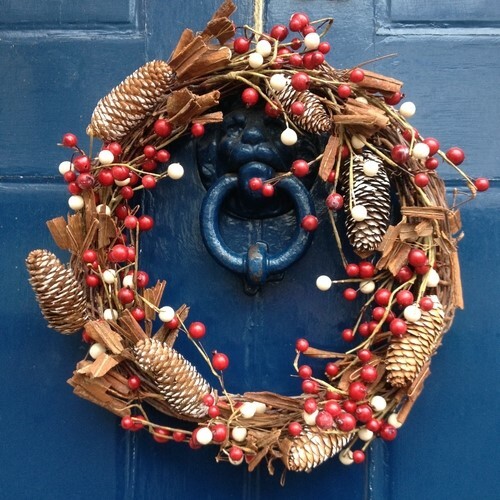 Whether you’re looking for a simple decorating idea or something more elaborate, there are plenty of options for decorating your front door for Christmas. Even the smallest of decorations can help bring more Christmas cheer into your life. Hopefully these ideas have sparked your creativity, and you can use one, or several of them. Happy Holidays!